What a strange movie. This Wrong Man caper is one of the few “big”-ish Hitchcocks I’d only seen once (except the Statue of Liberty climax, which is obviously its major claim to fame now) and also one of the few that I did not enjoy more the second time. It’s very good, with a few bracing and chilling sequences, but one of the big problems is that it’s little more than a series of setpieces — and several of those are all too obvious (and pale) cribs from the director’s British thrillers. Its propaganda and Americana elements — it’s kind of a blackened It Happened One Night, in a sense — make it quite engaging, but in even that regard I prefer Foreign Correspondent. This film does boast a few even weirder touches than that minor miracle of stunt casting and oddball characters, thanks probably to the script contributions of Dorothy Parker. The strong patriotic and liberal bent — lots of speeches here — likely has the same root. The opening setup is brilliant; as in Strangers on a Train, a chance bumping into someone starts everything and the minimalistic visual representation of the following explosive sabotage is stunning, proving that something on a small scale could prove just as striking as that unforgettable plane crash that closes Correspondent. From there, the film — like The 39 Steps and Young and Innocent before it, North by Northwest down the line — proceeds from one hot-water scenario to the next, distinguished mostly by the use of interesting character actors that it uses to comment on American (read: human, but it was the war) decency, while Robert Cummings represents good old fashioned know-how. One of the best sidelines finds him taken under the wing of an unexpectedly understanding blind man, seemingly a clear nod to the more elegant analogous moment in Bride of Frankenstein. A van full of circus sideshow performers revise the central philosophy if not the plot behind Tod Browning’s Freaks, almost arbitrarily. And whereas the poolside shock that ensues when Cummings is caught going through some letters is unforgettably heart-stopping, it’s unmistakably a lift from the missing-finger reveal in The 39 Steps. Such derivative material is fine when it serves the story or pays off. Things go less smoothly when plot points seem to be shoehorned, like when Cummings inexplicably chooses not to steal away with Priscilla Lane’s car while she tries to get someone’s attention, for no reason other than so we won’t be denied the weak reprise of the handcuffed-together romantics of Steps. Later, both Steps and Young and Innocent get violated when there’s a wonderful setup of a cat and mouse game in the middle of a ballroom, which Cummings chooses to solve by making himself extremely conspicuous. It’s a marvelously fun situation but it falls flat, with nowhere to go. The casting in Saboteur, as Hitchcock himself admitted, is a huge problem. While it’s nice that Lane gets billing over Cummings — a rarity for a film like this — it does say a lot about the latter’s star power, since Lane doesn’t even show up for 33 minutes. Both actors are amiable enough but Cummings in particular is such a whitebread bore of a straight man, likely one of the weakest matches for the director’s Wrong Man scenario since he exhibits no tangible emotion to speak of — except some bitterness that can best be described as “mildly miffed” — and Lane is of course better suited to comedies. That said, they do have better romantic tension by the home stretch than Joel McCrea and Laraine Day in Foreign Correspondent, partially because their dialogue isn’t nearly so ludicrous. The only truly inspired choice in the main cast is Norman Lloyd as the fearsome, nasty but laughably named Fry. 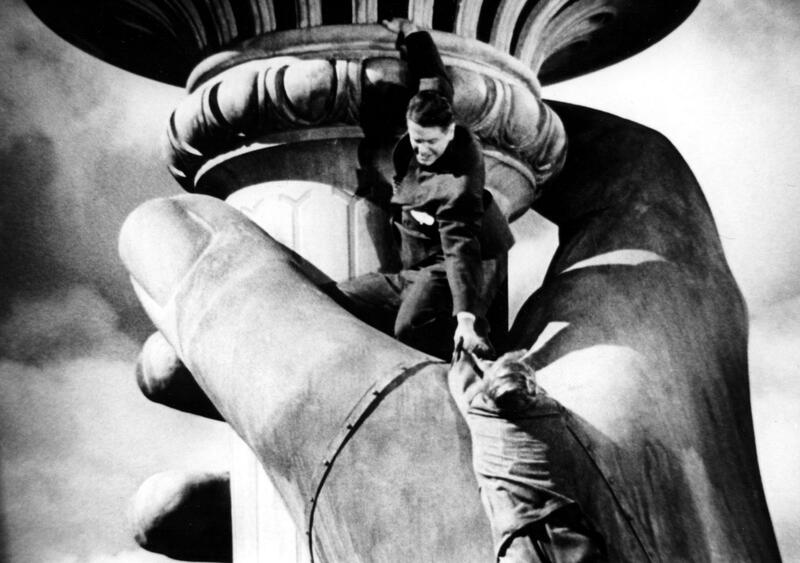 Hitchcock later wondered why he’d let the villain, not the hero, dangle from the Statue of Liberty but given the historical context here, it’s obvious — he wanted to give the audience the pleasure of watching him squirm. This was Hitchcock’s fifth American film and along with Mr. and Mrs. Smith his most anonymously directed. It’s not quite as sloppily edited (or meddled with) as Suspicion and it remains an entertaining firecracker of a wartime travelogue, but only at the beginning and end does it feel like a Hitchcock picture. Typically you know from just a few frames that he was the man behind the camera, but here there are only a few interesting shots in the whole of the midsection — like the one that sees Tobin framed bizarrely by a couple of paintings and a lamp while he sits on a couch and rants against America (in the reverse shot, Cummings is filmed from below and fills the frame like Superman or something). It’s remembered fondly as Hitchcock’s first true American thriller, and it’s great to see that classic sense of sweep and coast-to-coast urgency matched to a very intense time, but its pleasures are fleeting when compared to the masterpiece that would follow it.